The girls have nearly outgrown the brooder. While researching which breeds to select for our chicks, one attribute stood out to me: bears confinement well. The Dominique, Black French Copper Marans and the Olive Egger (half Marans) all fell in this category. Gigi is ready to move into the big coop. I dutifully took note, but didn’t really give it much thought until the last couple days. The birds are growing at an astronomical pace, easily poking their head over the edge of the brooder each time I lift the lid. This means only one thing: It’s time to move them out to the coop! With this latest development, I am so glad that the birds live up to their breed. 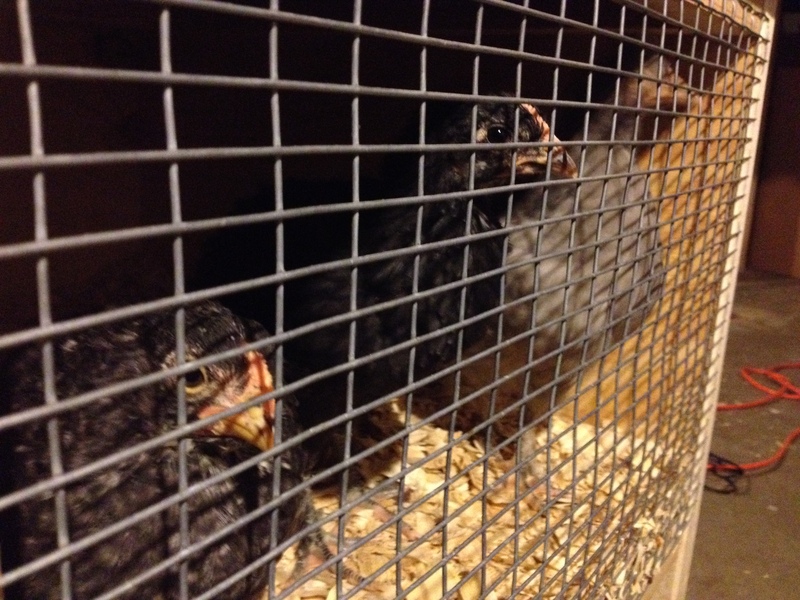 They have lived in a 2×3-foot brooder for the last six weeks, and managed to do so with no destruction to themselves, each other or the brooder. Bears confinement well, indeed. The plan is to take the birds out to the coop early Saturday morning, then finish up a few lingering tasks. We still need to install mesh in both the windows, and secure the feeder and waterer. Other than that, I’ll have to throw a layer of pine shavings into the hen house then the coop will be ready for prime time. 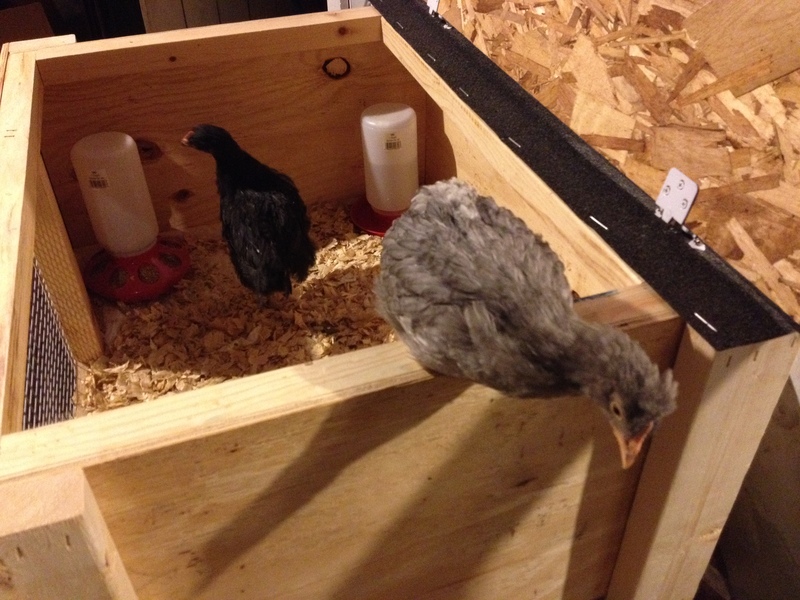 Nellie checks out the new baby roost during a visit to the coop. Last night, as I was thinking about the transition, I realized the birds are too small to use the roosts we installed in the coop. 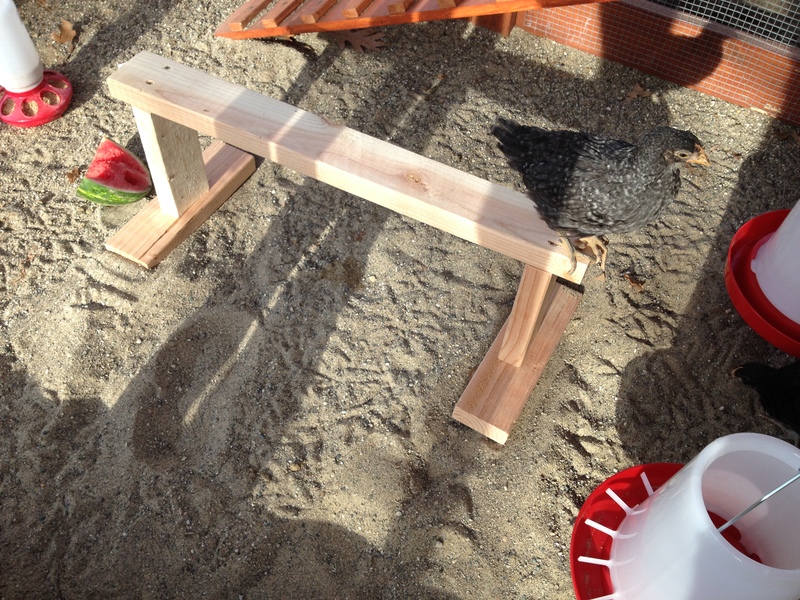 So in 20 minutes, I cut a few pieces of wood and constructed a small roost for the hen house. It stands maybe a foot tall. I must note that I did this all on my own, and I’m quite proud of myself! So now I am obsessing about the weather. Of course, Saturday night is supposed to go down to 35 degrees. From the message boards I’ve been surfing, this is about the lowest temperature fully feathered chicks this age can tolerate without supplemental heat. We will not be using a heat lamp, mostly because the coop is not yet outfitted for electricity and because even if we ran an extension cord out there I do not want to risk a fire. So being a good mama hen, I have charged the flashlight and am prepared to check on them throughout the night. I would be lying if I said I’m not worried. But I have a great feeling that everything will turn out just fine. 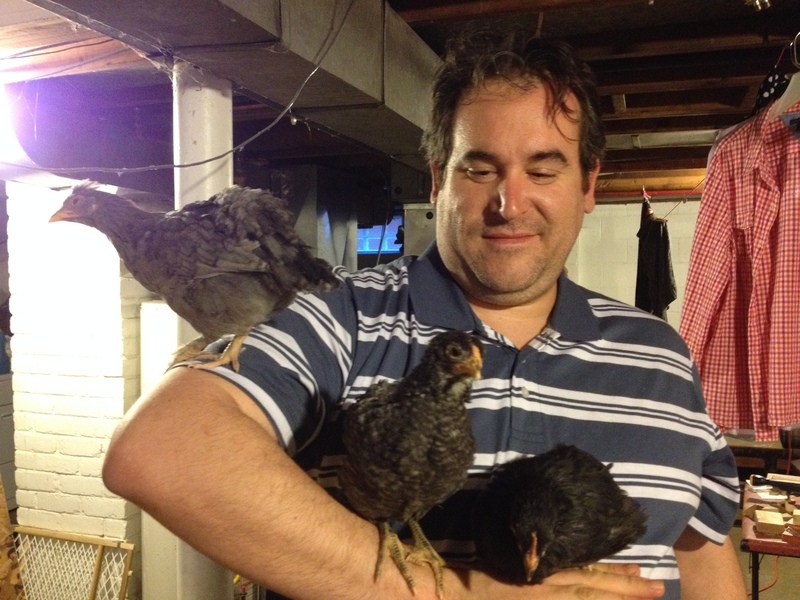 Matt has his hands full with (from left) Gigi, Nellie and Loretta. Wow! They are big. I just ordered my babies yesterday to be shipped in Augusy from My Pet Chicken. 6 in all, Austolope, Americana, Silver cuckoo Maran, Welsummer, golden Wyandotte, and a Buff Orpington. Guess we better get cracking on the coop! Is that river sand in the bottom of your run!? Wow, you’re officially getting chicks! How exciting. I remember how awesome it was just to get that order in!! The sand we have used in the run is a combination of All-Purpose Sand from Home Depot, and a few bags of tube sand that we picked up from Menards. Mostly, we were looking for sand that had small bits of gravel and pebbles. It was as close to construction-grade sand that I could find. So far, the chicks LOVE it. Best of luck with the coop!!! !